NDA began doing street art with his friends when he was living and working at a print shop in New York City in his mid-twenties. 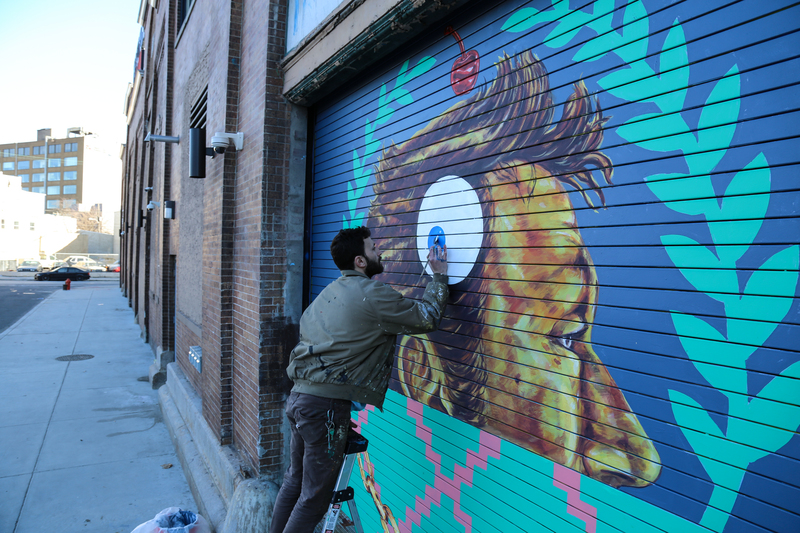 One of his best friends and primary mentors — the Reno, Nevada based muralist and street artist Over/Under — taught him the tricks of the trade and and encouraged him to pursue a career in public art. I went to school when I was 19 for animation. I thought I wanted to be a 2-D, hand drawn, classical animator, and then I realized that was too much work and just didn’t do it. But I think as a kid I just always drew comics and stuff like that. Afterwards I went to Brooklyn College to finish up a BFA. But honestly my best training was my friend who got me into muralism. He would just show me how to do things with street art, show me how to do murals and we would work on stuff together. His name’s Erik Burke, but he goes by “Over/Under”. He’s great. And he has skill sets that I don’t have, so I watch him and it’s like watching an alien do something. But we have similar tie-overs in our work, so he was able to help me just by my watching him paint. I’m always jealous of people that have left and right brain. ‘Cause I’m 100% right, I feel like, and technical stuff is a struggle for me. And he just sees it, on both ends, and can also be adaptive and creatively fluid, as well as understanding scale with actually using math *laughs* So, he’s a bit of a wunderkind type. He was a good teacher to have. When I met Erik I was working at a print shop in SoHo, and his girlfriend at the time was working with me in the press. I can’t remember how we got into talking about art, but she was like, “My boyfriend’s an artist and I think you guys would get along.” Then we were talking about doing some project together, and I think at first I was like, “I don’t know about this guy.” And then we started hanging out and it was just, like, very easy, y’know? And then I think he realized that I could probably do this thing, and pushed me towards it, ‘cause it was not ever something that I had thought about in terms of a context for myself. I didn’t know anything about street art at all. Like I moved to New York, I didn’t know who Banksy was or, like, any of it. Y’know what I mean? And I still don’t, really, I’m a little oblivious *laughs* Like I keep blinders on a little bit. But at that time it was a whole thing that I had never even considered or put much thought into at all, like what it is or how to do it or any of that. When I was starting out, a lot of it was just fun, drunk nights of just painting at my buddy’s house and then going to put that stuff up. And I’d never really thought of myself as being—I wasn’t into street art, I had no understanding of it when I first started. It was like this weird thing that I fell into. And then once it started happening, I started realizing that working in a large scale, in public work, opened me up socially and creatively. Art for me, before public art, was always a thing that was done in my studio or a room by myself, and then eventually when there was an end product, I might show it to people and I might not. And then public art just opened me up in this way where now I’m totally fine with showing work to people as it’s happening, I’m not self-conscious about it. It’s given me this confidence that I didn’t have before, and it’s been able to link the thing that I feel is my main skill set in life with social stuff, because I’ve gone and travelled and been able to paint murals while I’m working. Really, overall, it’s been one of the more positive things that’s happened to me as an artist. NDA’s creative practice is the most vital part of his strategy for managing depression. For him, the accessible and egalitarian nature of creating in the public space helps to forge meaningful bonds between people and opens up channels for creative expression that larger sectors of society can benefit from. *Laughing* I mean without it, I’d probably kill myself, I don’t know. *Laughing* Not to be dark or anything… I would be super depressed without it. That’s number one. It’s my sense of worth. You get to pick a thing, and I’ve chosen this as my life, y’know, my goals going forward are creative. I don’t know what I would do otherwise. Before I had this as a job I always made art and that was always the thing that I was decent at doing when I was younger. I was always miserable doing work for other people, like customer service. I just became like the grumpy barista. And I’m not taking away from anybody that does that type of work, I just don’t do well in those situations. And then once I was able to make this my job—it has its own pitfalls, I definitely think there are parts of that that I’m still working out and are problematic that take away from the joy of it. But overall it’s like me curating the life I want to have. It just keeps me sane and mentally healthy and engaged with the world. If I’m not painting murals, and I’m not doing things like public art, I’m indoors by myself, often. So this is the thing that gets me out into the world. Plus I think the job of an artist is to stay open to the world, so it keeps me engaged in multiple ways—they serve each other, you know what I mean? Like me going out on a walk is both healthy, just in that practice, and then also for what I get out of that artistically. Everything becomes research for what I do, and then you see the world through what you’re going to make or what you might want to make. Street art, it’s very egalitarian. If you want to do it, you can do it. There’s nobody saying you can’t use our space. I mean you still want to be ethical about how you proceed, but I think it opens up doors for people. It’s not a matter about it being good or bad, it’s about it being sort of this equal playing field for people. I mean, granted, it is still a space where predominantly it’s a white, male dominated arena. But I think more and more we’re seeing it be a less of that, y’know? I’m saying that as a white dude, I realize. But I think that’s what, ideally, is good about street art, it isn’t this thing that you have to come to it, and there aren’t all these gatekeepers. What’s important about muralism is, just, there are plenty of places where people don’t get to go to galleries. 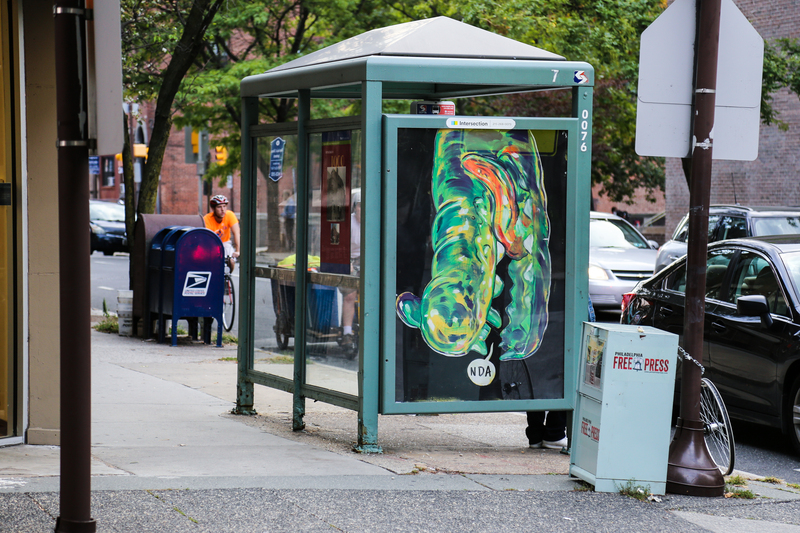 There are lots of neighborhoods where art isn’t immediately accessible. So to have things in a neighborhood that are done for the neighborhood, and then people get to see artistic context—like when I’m making murals and then kids come by and get to see how that’s made? When kids respond positively to it, I think that that ends up being the main positive thing, is that now kids get to see how something is not just this alien thing that comes up and they go see it after the fact, or they go to a museum and see all these dead people’s paintings, y’know, They get to see something that’s a living, breathing part of the city. And that also maybe inspires them. Like I’m not saying that every kid’s gonna go and say they want to do that, but it has happened, where I think you see the lights turn on, y’know, the gears turning a little bit about like, Oh, I could do that. And that’s positive. 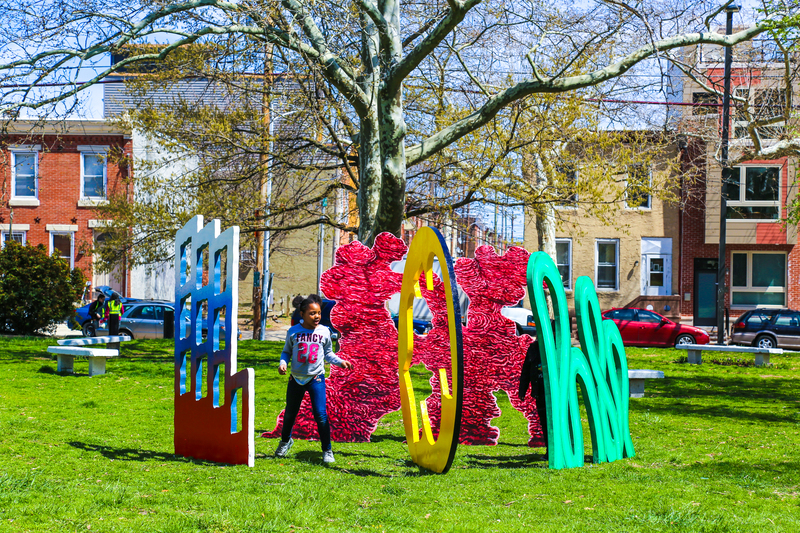 Back in April, NDA introduced an innovative series of street art sculptures for temporary display around his neighborhood in Point Breeze. The pieces were a big hit, especially with neighborhood kids who enjoyed interacting with the sculptures and developing their own interpretations of the art. 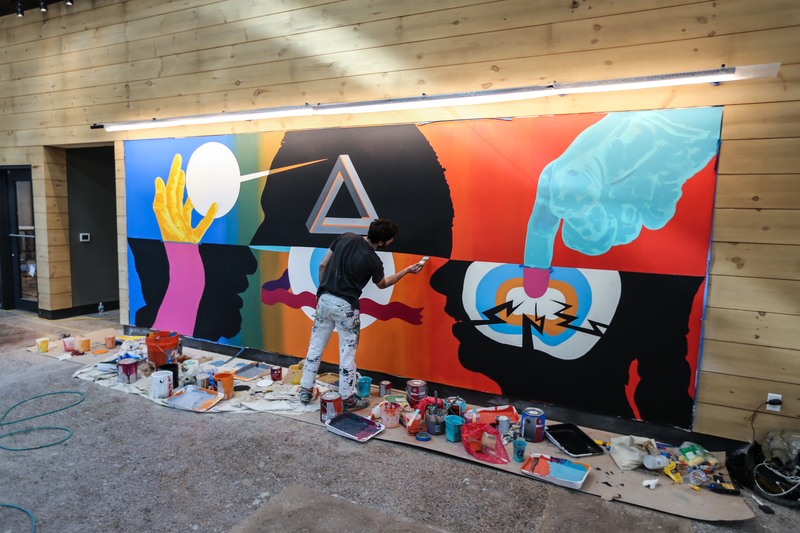 When working in a street art context, NDA tries to strike a balance between challenging himself to develop new concepts and being considerate of how the works will fit into the communities that he places them in. Street art provides a venue for the artist to work with new ideas that might later be applied in commissioned works. Too much down time inspired the sculpture project, honestly. I was pretty depressed this winter… I wasn’t sure how I wanted to approach street art going forward, and I wasn’t sure that I wanted to do it anymore; I just had a lot of issues with it. I just realized that I was hitting some of the same notes. And this idea came to me, and my step dad had done set design stuff when I was a kid. I was just back home and I was talking to him about this idea I had, and he’s like, “Well you could try it with Styrofoam. That’s what we would do, often.” Y’know, they did it differently than I did it, but it sort of became this thing, like, I think with sculpture it becomes a very cost-prohibitive type of art. And it still cost me some money, but I realized that in my downtime now I want to be focused on these projects like this, things that I haven’t tried before and things that are gonna keep me engaged and make me feel like I’m pushing forward a little bit. So now, through doing it this way I’ve been getting some interest in people wanting to see them in their spaces, and it’s just a different problem solving technique than it would be if I were putting it directly on the wall. The more I think about it, I don’t think it’s appropriate that public art be so prescriptive that it tells you what you already are. I think art can be for art’s sake wherever you put it. That being said, I do think you want to be a little respectful, like there are times when I’ve done things and it’s been referred to by neighbors as “aggressive.” I’d say that’s a word that people will use. And you do that enough and you start realizing that you can’t just airdrop whatever you’ve made into a space. It has to be right. And that can be a feeling, y’know, like this isn’t gonna work here or this will work here. Or that could be just directly talking to people before you put something up, which I’ve done. And Philly is a very open city for that. Places like New York, where it’s very ticket-heavy and cop-heavy where they will—you can’t just go out in the middle of the day—I mean you can—but the idea of talking to someone and taking your time, there, is a little more foreign than here. In Philly I could just hang out somewhere and work and cops’ll drive by and it’s not—it’s not the the same thing. So you can be a little more methodical about it, and that could mean having a conversation about why you’re doing it. So I think when people put a face to it—and I’m good with not shutting out whoever is around—if you have a question and you’re not being disrespectful and yellin’ at me, I’ll answer anything. And I think people will champion a piece if they have some sort of interaction with it or some relation to it. 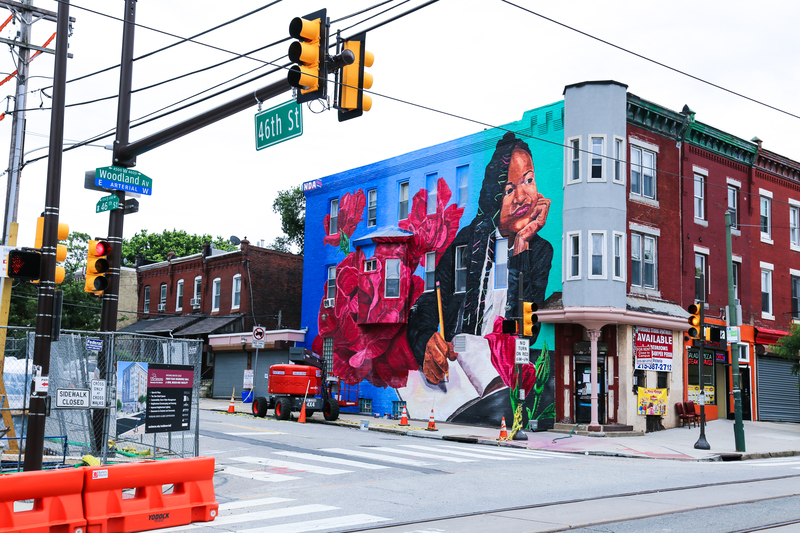 Like with the mural I recently did in West Philly, I talked to anybody that wanted to ask me about the mural when I was making it, it’s part of my job as a public artist to be able to talk about it publicly. Y’know what I mean? If you can’t do that, you shouldn’t be doing public work. People that just put their headphones and don’t engage with people, I feel like you’re missing a big part of that experience. So I think that’s a big part of it, is like being able to come into an area and being open to what that has to offer. I don’t agree with that idea that you have to just talk to whatever is already in the neighborhood, though. Because I think that’s a little like pandering. Y’know? If you’re thinking about the most ideal version of a thing, it’s to enrich people’s lives. First and foremost. Hopefully. You know that’s what you hope for. And so, if that’s the case, I don’t think that just telling them what they already know about their space, especially if I’m not from that area, that’s like condescending and I’m using it a little too much for my advantage, and I think that that’s something you have to be careful about. When I’m doing something illegal and someone asks me. I mean, I think I’m just pretty honest about it. They’re like, “Do you have permission?” And I’ll just say, “No,” if I don’t. Or I’ll ask people if they have a problem with it. If somebody’s really, adamantly against something, usually it’s just paper, so I could take it down or not even start, y’know? I mean if someone comes up to me while I’m like still mapping out where I’m gonna put it, and they’re really upset about it, I’m like, Y’know what? I’ll just roll it up and go. Y’know, like it doesn’t need to be a fight. I don’t want it to start contentious. And sometimes when people ask, like the funnier one is like, “What is it supposed to be?” And if it’s abstract you’re like, “Well, whatever you want it to be.” And then you’re like, “I made it because I was thinking about this.” Usually I talk more about process, like how was it made, other than what it is. Because oftentimes when I was first starting to do murals and street art, you would have this idea in your head about what you were doing, and it never matched with the person’s perception of it. So it’s kind of pointless to be so direct about meaning. Y’know? Because part of the joy is people giving their own interpretation of it and making it theirs. At this point I feel like street art is part of my practice. And whether I’m getting paid for it or not is irrelevant, y’know what I mean? Yeah. Its like, I need to do it, and I hope that people get some joy out of it. And like I said, I’ve had times where I’ve realized that I’m overstepping or being aggressive or whatever, and you try not to make those mistakes, but like everything, you’re going to do that sometimes. So just trying is at least a step towards being a better public artist, I guess. Or a more respectful one, I don’t know about better. NDA’s most recent commissioned piece is a mural that celebrates his neighbor Diamond, a successful Philadelphia Public Schools student-athlete. 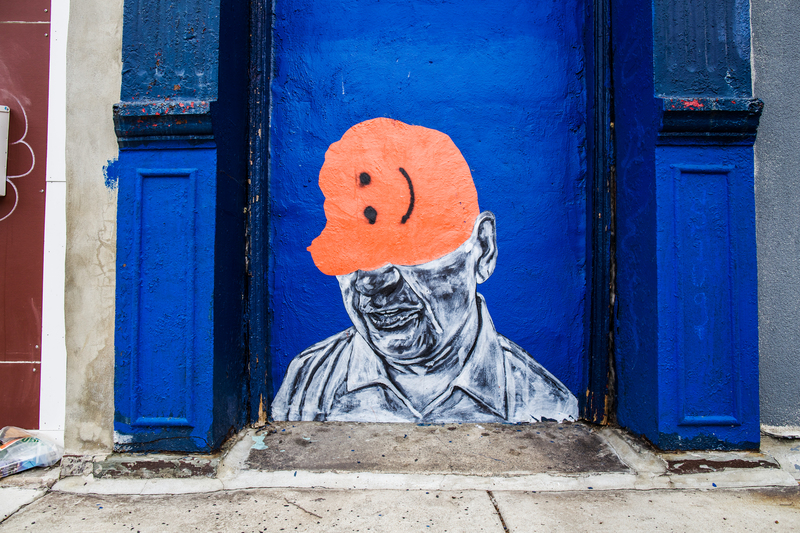 The artist’s bright portrait of Diamond commands attention from a massive wall space at 46th street and Woodland avenue, directly across the street from the former site of a Philadelphia Elementary school that was demolished in order to make way for University of the Sciences dorms and retail space. In an Instagram post about the new mural, NDA emphasizes the need to put more funding into K-12 education in inner city neighborhoods. 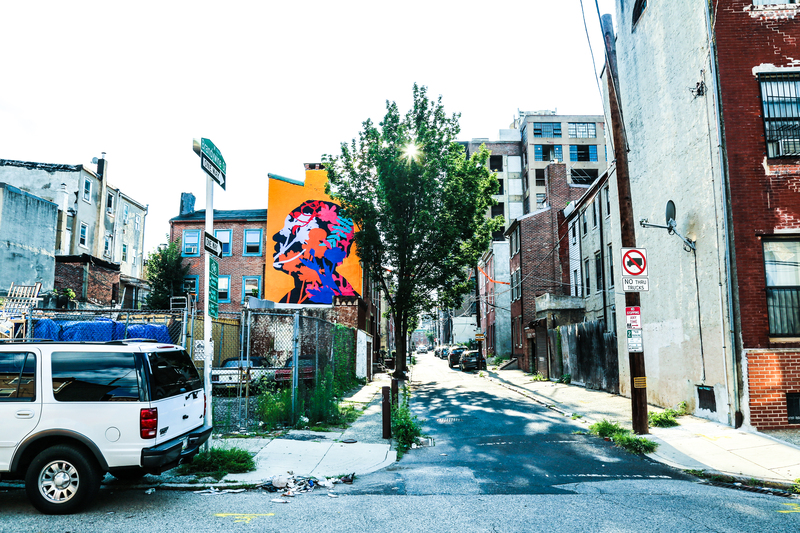 To determine the final design for the project, he worked with the developer that commissioned the piece, Diamond and her family, and residents of the West Philly neighborhood where the mural would be installed. So that’s one where you’re dealing with a client and they want something that reflects the community, and they also want something that’s pleasant. You’re trying to work around their needs, as the person that’s paying you. 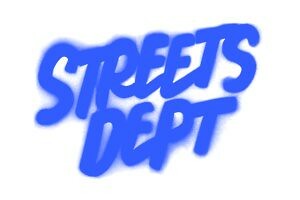 My initial design attempt was something a little more based on some street art stuff that I’d done, something that I wanted to make, essentially. And I think that the client felt that that wasn’t going to be a good fit for the neighborhood. So we went back and forth, and I kinda realized through some of the conversations and emails that they probably wanted something more to do with a younger subject matter and also maybe reflecting what was in the community, not what was happening in terms of all the development. And so, I knew from having biked around there previously that there was a school that had been demolished across the street. So I proposed making it about education. And then having gotten to know my neighbors, this girl Diamond, like every time we talked it was just like, “Oh, she’s doing this cool project, she’s like in a gymnastics competition, she did this in school.” And I love the idea of someone doing well and getting some shine for it, y’know what I mean? It’s not like before she expected this to happen, and then it’s like how cool! I don’t know, if I was thirteen, that I’d want that, ’cause I was a very awkward thirteen year-old *laughs* But, I think for some people that can be very empowering. So it’s a win-win in that regard, at least for me, that’s how I see it. I was doing some prep sketches of her and everything like that, so she knew—I was asking her, I asked her family. Y’know, it’s a weird thing to just talk to a thirteen year-old girl and then put her picture up on the wall. So I had to talk to the folks and explain what I was doing. And y’know, it’s one of those things where sometimes I don’t know who I’m gonna use for a piece and then it’ll just come to me, and like, she just seemed like a good fit. And then it was just convenient, ’cause they lived on the same block as me. It was sort of, a good happenstance thing. Her reaction to it, at first, was not positive. *Laughs* ‘Cause she’s a thirteen year-old girl and I think she has ideas of how she is and it wasn’t 100% a likeness of her, I don’t think anything like that ever is. I jokingly was saying, if you want a brutal critique of your work, show an unfinished mural of a thirteen year-old girl to herself, and listen to her reaction. She was with her friend and they were just like, “Oh my god, I look like a man!” And I had just got done with a twelve hour day in the hot heat and I showed them this picture, and I went from being just tired to being like, What’s the point of doing anything. But then it like came around, and her family saw it and they’re like, “Yeah, it’s her.” So I feel like, at a certain point, it’s way more about the idea of it than it being about a specific person, and then that’s like an extra component to it that I try to add into the stuff if I can, y’know? Diamond and I don’t live in West Philly, so that was the thing, too. We had a community meeting about this mural, and I was asking if we should use someone from the neighborhood, and some of the moms were in agreement that if I were to do that, somebody would have an issue if it wasn’t their kid. So to me, it’s a tricky one. Some people got mad when they found out she wasn’t someone from the area, ’cause I think that there’s always gonna be that thing. But, somebody would’ve been mad if I did it one way and somebody would’ve been mad if I did it the other way, and I had to make a decision. So, y’know, that’s how I decided to go with it. Community meetings vary neighborhood to neighborhood. I’ve gone to some meetings where it’s like you’re one of multiple things on the agenda for the meeting and you just sort of wait your turn and then you come up with a proposal and people—like with Mural Arts, they do a lot of due diligence about making sure they get X amount of signatures before they start, and then going and canvassing around the neighborhood. So yeah, you go in and you show them the proposal and you talk a little bit about it and you hear people’s concerns. And if there aren’t any then you move forward. But, y’know, people were complaining about—not many people—but some people were complaining about not being asked. It’s like, Well, I can’t go door to door to everyone—I mean I guess you could. But, we had a community meeting and I would hope that people show up to those. That ends up being one of those things, too, that at a certain point you do have to just make a decision on something. 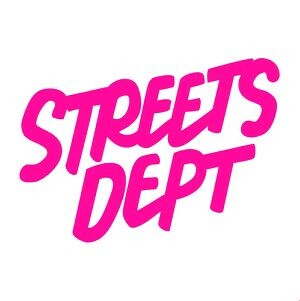 Because people have ideas about what they want to see, and it’s like the street art thing we were talking about earlier, once it’s out in the world, usually it’s met with positive feedback. But like until that point everyone has trepidations about it, because it’s like a foreign idea, and then it comes in and it starts to flesh out and then people usually come around to it. 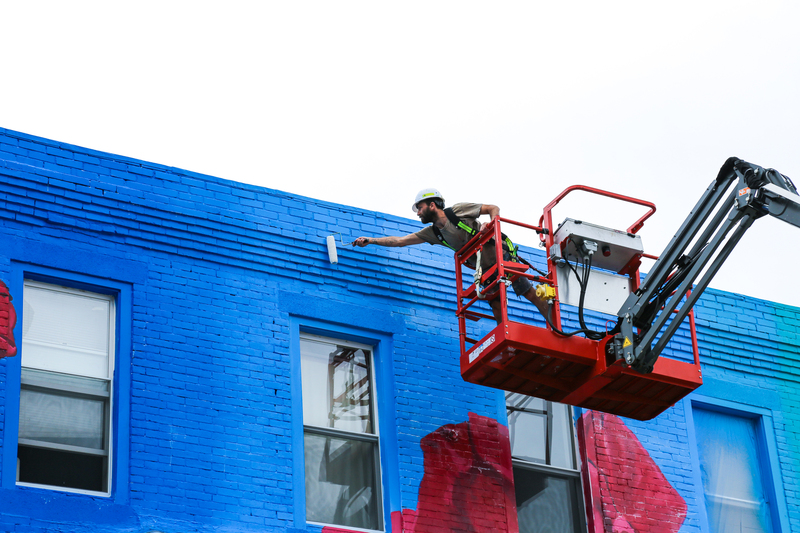 While NDA recognizes the ways in which public art can serve art as an agent of positive social change, he is also sincere about the ways in which it can be co-opted to contribute to gentrifying development projects that are harmful to established communities in the city. 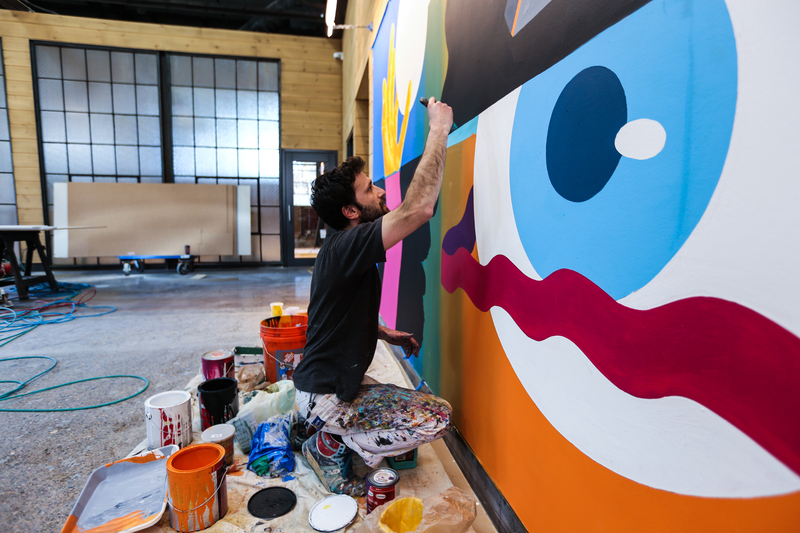 As a public artist, he must learn to manage the tricky position of working on commission from developers who want to make significant changes to neighborhoods while also keeping in mind the interests and representation of longtime residents. Over time, he feels that he has bettered his ability to detect the bad intentions of potential clients who hope to exploit him and the community he is working in. Obviously, policy-makers and people that could actually effect change from that level, are gonna be doing the heavy lifting in that regard. But I do think that public art is a discussion, and it’s a discussion in a community, y’know? And so it does sort of help, I think, in that regard. I also want to make sure that I’m not doing something that’s a “sticking the middle finger up”, especially. I want it to be more celebrating the positive of something that is there, more about what’s happening there in the neighborhood. Like you don’t have to do one at the expense of the other, or just be someone shaking your fist, y’know? 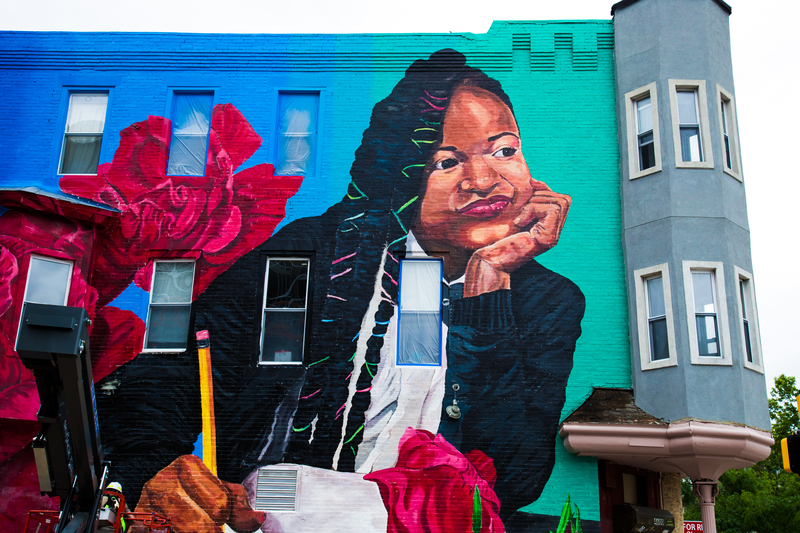 And so, to me the main goal with the West Philly mural is to talk about students and talk about education in Philly, and I have a lot of friends who are educators here, they tell me that the education system is very problematic in this town. Like just the fact that like, Diamond, she’s a gymnast and a runner, and she’s gonna be going to a school that has no gymnastics program, there’s nowhere she could actually do the thing. So if that’s something she could potentially start bettering herself in and getting into colleges through that and getting scholarships, that opportunity is now not afforded to her. And just all these issues with standardized testing and all the lack of funding in schools and teachers having to pay for their own supplies, and then schools getting shut down left right and center, and charter schools, and— Sorry, I don’t want to get on a soapbox because I’m not a politician. I’m an artist, I just have feelings about this, and it seems like from a lot of the people I talk to that there’s a lot of problematic stuff going on there. But I don’t want to focus on that, I want to bring attention to what’s positive, and that’s that these students are really doing great jobs in their community, and will continue to do that in higher education and all these things. It’s important to give them some shine. I mean the reality is, I’m still taking developer’s money to do these projects. So it’s like, what good can I do with it? ‘Cause I wouldn’t be able to do this without the funding, so it’s this double-edged thing where maybe some people would see that as part of the problem, but the fact that they’re willing to put the money towards the arts, I have this opportunity now to say something with that. And I’d like to make that count to some degree, y’know? And so, again, it’s like focusing on the positive, and if it brings up a real discussion about what’s happening with education, then all the better. But I think the focus is to be, like these kids are—not to sound super contrived—but they are the future and we need to give them their due. Y’know, we need to pay attention to them, otherwise we’re—as a city—falling short, y’know? I think. Sorry, I feel like talking about these things is like not really my place, but I have feelings about it. 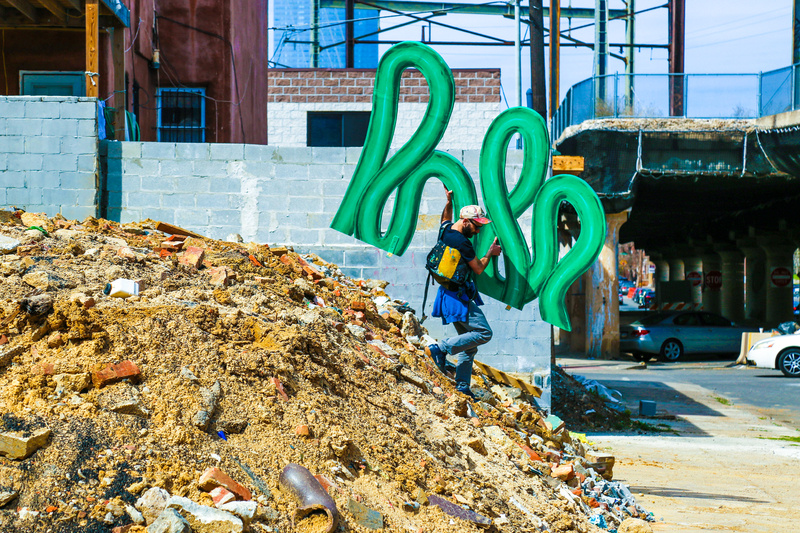 Absolutely there is public art that is created with a gentrifying objective in mind. There are developers that understand, if I put a mural here it adds to the cultural capital of my space, it might even add to the net worth of the building that it’s on. There are people that understand on a financial level why it’s a positive and they’re not making art because they want to see art up. But again, it’s like, I have to choose between, like—if the project doesn’t feel like I’m going to be able to impact things positively, and it’s gonna be in a public space, more and more I’ve been saying “no”. I’ve said no to things recently that have really felt like it was using art to make your goals come true, and your goals aren’t in sync with mine and certainly not with the community that they’re in. And so like, as much as I’d like to make that money and y’know *laughs* being quite frank about it that’s what I need to do to stay in this profession, is take those jobs—some of them you have to say no to. I think it’s your responsibility to be able to suss that out. Do I get it wrong sometimes and work with bad people? Sure. But I think I’ve gotten pretty good at feeling that out and understanding people’s intentions before we get started. And yeah, murals are a part of gentrification, and that’s happened as a result of places like Wynnewood or Bushwick, or you name it. There are plenty of places where the murals have directly related to what has become a gentrifying force in a neighborhood, y’know what I mean? Raising the property values. But I do sort of feel like with places like Philadelphia, because it’s embedded from a grassroots, community level, from decades of mural projects going on, that it might be a little different here? But I don’t wanna totally brush over that, because I think it’s an important conversation to have. But it’s about artists picking who they work with. Like, we sort of think as artists that—when we start out and we’re hungry—that we have to take everything. ‘Cause if you say no then the word is gonna get out that you’re difficult. But I think it’s actually the other end, like, if we say I’m not gonna work with you, and tell them why, and I don’t agree with this, maybe not everybody’s gonna get it and maybe they will just go on to somebody else. But you’re not giving them your thing, you’re gonna go with people that you trust and believe in, y’know? And so I’ve realized that over time that there’s like a little bit of a balance to that. Like, I’m taking developer’s money to do certain projects, but I’m also trying to be selective of who I work with so that at the end of the day I can feel like it wasn’t an exploitative thing across the board. Recently there was a developer who wanted to put a mural in his space to make way for something he was gonna build there over time, and it came clear to me through emails that he was having with me and people in the community that it was very contentious. A: He didn’t care about what they had to say, and B: He thought that what he was doing was right and that everybody was wrong. Y’know, it was this whole thing of like “I’m the smartest one in the room.” And I realized that by working with him I was gonna become lumped in with his plan and I didn’t agree with his plan. Like he was saying he’s doing this mural, basically as an advertisement for his construction project, not for art’s sake. And it was at a time when I was coming out of the winter and it would have been nice to take that job. I’m not trying to like pat myself on the back, but I said no because it felt wrong on a lot of levels and I didn’t agree with his broader goal and just how he was going about it. So it was easy—when I said “no” it felt like a weight had been lifted and, y’know, I didn’t lose any sleep over it. Look out for new, innovative work from NDA in… Reno? I met Over/Under in New York but he’s from Reno, Nevada. So it’s kinda cool, I get to go back to Nevada every once in a while. He’s one of my best pals so I go there just to hang out but then we usually end up doing projects together while I’m there. It’s funny, I probably have more work in Nevada than I do in Brooklyn? That can’t be right. But something like that. And a lot of the projects I’ve tried to do in New York or here in Philly as well, I get to try them in Reno, of all places. Like I’ve actually done the first version of something there multiple times, and it’s just kinda cool because it’s this place that I feel like I have a community in, and they’re receptive to it. The first time I did one of my silhouette murals was in Nevada. Yeah, it was in Eureka, Nevada. And that was through Over/Under. That was the first time that I got to try that silhouette project that I’d been trying to do here in Philly and in other cities. And he was like, “I’m gonna get this going here.” And they were excited about it. Y’know, it’s an interesting place. And I like it because it’s like a lot of old cowboys, too. So there’s this thing in Philly where you’re dealing with developers who will haggle with you a lot. But in Reno they’re real straight shooters. They don’t mess with you about pricing, they’re just like, “Cool, that’s the price? That’s what it’s gonna be.” I’ve never had a problem there, y’know? It’s always been pretty like, “it is what it is”. Over/Under is even talking about trying to get me down there to do some of these street art sculptures in a permanent way. I just think that he’s been probably the biggest reason why I’m doing what I’m doing right now, so I owe him a lot. If you’re in Philly on Friday, July 6, be sure to check out the opening of NDA’s solo sculpture exhibit at Imaginary Clouds gallery: More info here!